Summer is synonymous with mangoes - at least in Florida it is - and this mango cake is a perfect way to use up all those delicious fresh mangoes you may have at home right now. I have also had a jar of cardamom spice sitting in my pantry for well over a year (maybe two?! ), and I've recently begun experimenting with it and have fallen in love with it's delicious flavor as you can tell by me releasing two back-to-back cardamom recipes in less than a week. 😛 If you missed this tasty Cardamom Cinnamon Breakfast Granola recipe you can check that out by clicking on the link. I wasn't sure what to name this recipe - Is it a snack? Is it cake? Is it both? I'm here to tell ya it's all of the above. It's definitely cake-y in texture, sweet in taste, and beautifully decorated with a yummy mango frosting layered on top - which makes this a perfect dessert recipe for any celebration. 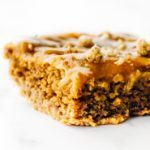 But it's also a really healthy treat - sweetened with dates, gluten free (if using certified GF oats), and refined oil free - which means you can enjoy this cake as a snack on any given day, no celebration required. Mangoes. We need mangoes for this cake to happen, or else it's just an oat flour cake. I use fresh mangoes because in the summer we have an abundance of them.. I haven't tried the recipe with frozen mangoes yet but if it's all you've got, I'd let them thaw out first. Usually 2 medium sized mangoes will be enough for this cake. I put the measurements below in grams, but if you have a few grams less (or a few grams over) it won't break the cake. Rolled Oats. I process my oats in my food processor and make my own 'oat flour' that way.. but if you've got store-bought oat flour it will work just the same. Medjool Dates. Any dates work really, but medjool dates tend to be sweeter and softer which work great in blended recipes like this one. If your dates are a bit on the tougher side, soak them in water for about 30 minutes beforehand. This dessert is entirely sweetened with dates - and that's amazing because I like giving agave a break every now and then. Apple Cider Vinegar. What? Vinegar in a dessert?! Well, I did say it was a healthy one, and plus, apple cider vinegar gives such a nice contrast to the sweetness of this cake. Make sure not to skip out on it because although very subtle, it does affect the taste. Cardamom Powder. I've had cardamom powder sitting in my pantry for well over two years maybe, and now is when I'm finally experimenting with it's subtle but enjoyable flavor. Cardamom pairs so nicely with mangoes that I had to include it in this cake. Plus, it helps make this cake taste more like cake in my opinion. You can totally leave it out of course and you'll still have a delicious mango cake in your hands but I encourage you to give it a try with the cardamom. Oat Milk. 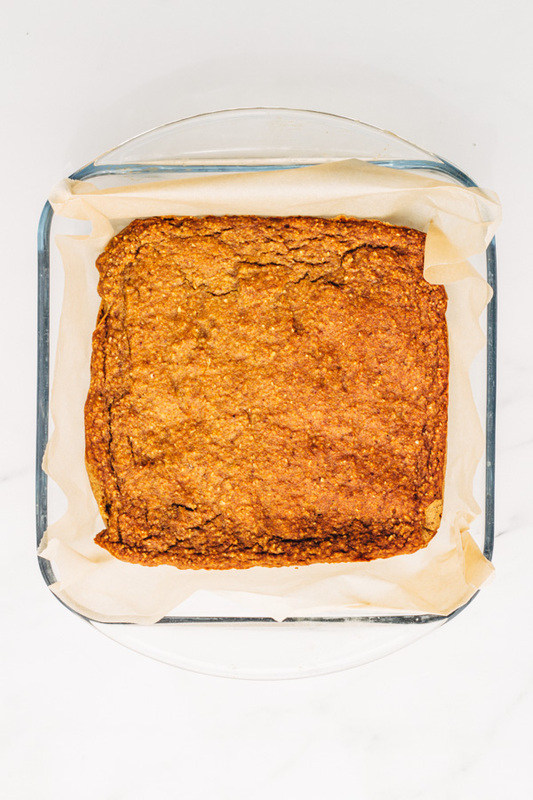 This mango cardamom cake is tasty as is, but add to that 1/2 cup of oat milk sprinkled on top, then let it sit for a few hours to allow that milk to seep into it's cake-y layer... and now you've got something that you'll be raving about friends. 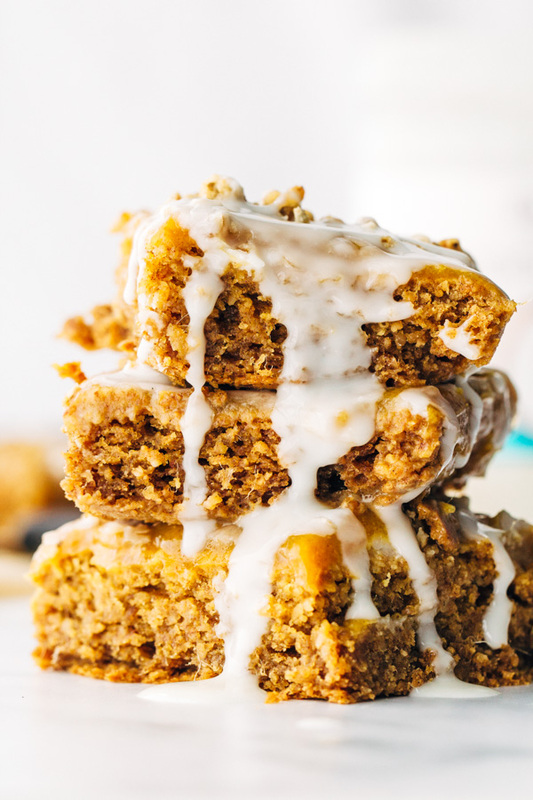 Of course this extra step is totally optional as well, but without that extra oat milk on top the cake will be less moist. Once the cake has finished baking, make sure to drench it with some oat milk (any sweetened nut milk should work), layer it up with the delicious mango frosting, top it off with some chopped mulberries, cacao nibs, and coconut shreds, and finish it up with a nice drizzle of coconut butter, because why not. Want to see more dessert recipes? If you're into mangoes - check out this Creamy Caramelized Mango Ice Cream Pop recipe, or if cardamom is your thing - check out this easy Cardamom Cinnamon Breakfast Granola recipe. 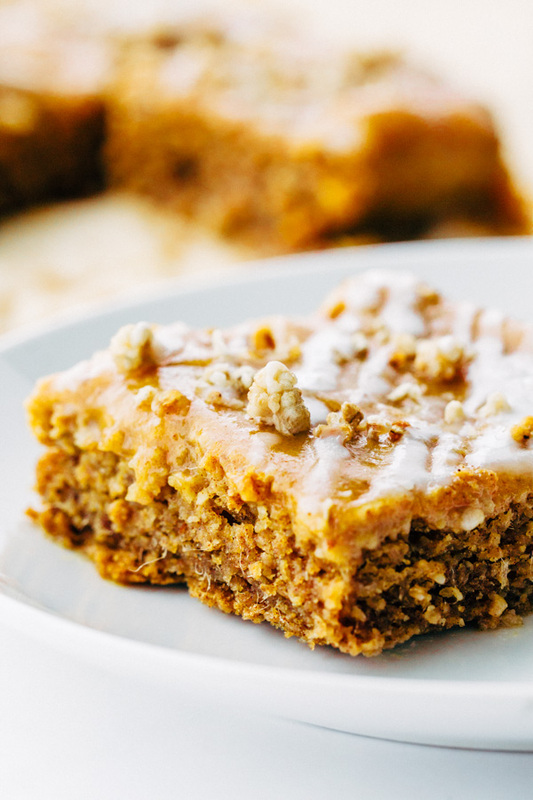 A vegan mango cardamom snack cake that is full of sweet flavor. It could be a cake, it could be snack, or it could be both! Oil free and Sweetened with dates. Preheat oven to 350F. Add oat flour, baking soda, cardamom powder, and salt to a bowl and gently combine. Set aside. Add mango flesh (remember to set aside 1/4 cup for the frosting which we will be using later on), apple cider vinegar, vanilla extract, and dates to a food processor and combine. Add this wet mixture to the dry bowl and mix with a spoon until evenly combined. Spread the batter onto an 8×8 square baking dish lined with parchment paper and bake for 50 minutes at 350F. Make the mango frosting: Add 1/4 cup of mangoes, dates, and apple cider vinegar to a food processor and process until smooth. 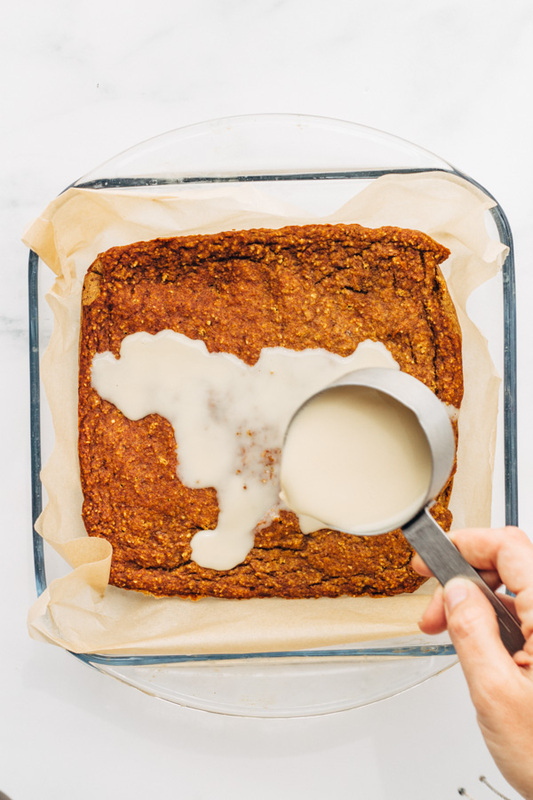 Once cake has baked – Using a toothpick poke a few holes on the top of the cake (to allow the milk to seep through) and add the 1/2 cup of oat milk making sure to cover the entire square cake. Add the mango frosting on top. You can dig in as is for a yummy moist and warm cake, or you can let it set overnight in the fridge. The cake will be more firm on the 2nd day. I use regular rolled oats and process them into flour using my food processor. Please note, if making your own oat flour using a food processor – let the oats process until you have the finest flour you can get. If you leave the oat flour kinda clumpy it will affect the texture and outcome of the cake. Try to process it until the flour is as thin as you can get it. The cardamom flavor is optional, you can leave it out. Adding the oat milk on top in the end is also optional but it makes for a very delicious addition. 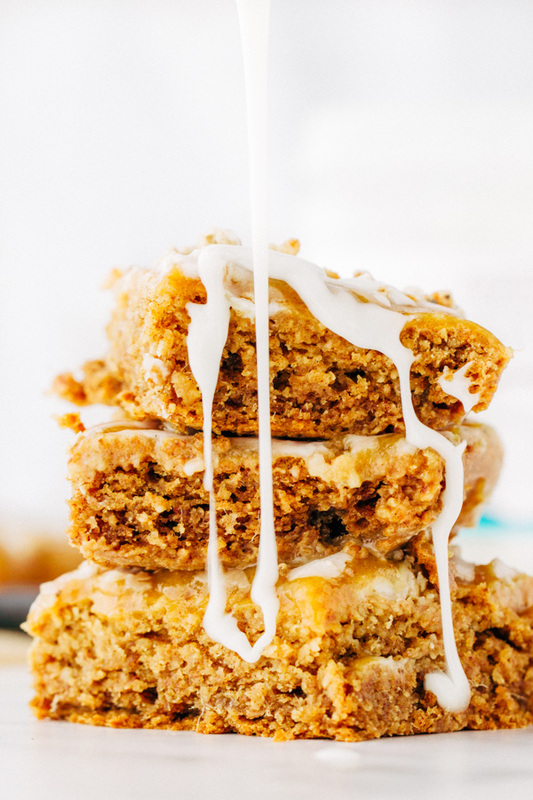 Oat milk is very sweet so it adds even more sweetness to the cake, and it also adds more moisture. If you leave this part out the cake will be a bit drier. I didnt have good results with this 🙁 I had my doubts when it spread so thin in an 8×8 pan, but went with it anyway. It didnt rise at all, is it supposed to? It came out thin and quite dry despite me cutting the cooking time to compensate for its thinness. I probably should have switched to a smaller pan, I think I would have had better results with that. I ended up spreading the mango glaze over the top then flipping one half over into a sort of sandwich, and then covering it in a coconut butter drizzle. That made it quite tasty, even if the cake part was a quite dry. I will definitely try this again in a smaller pan. I love all of the flavours involved in this so I want to make it work! Hey DB – I’m so bummed out to hear it didn’t turn out well for you. 🙁 I’m not sure what went wrong .. the cake should rise quite a bit to about one inch. As you can see from the pictures, the squares are pretty thick, definitely not thin. Hmmm did you sub anything out (maybe used baking powder instead of soda?).. So strange!! I’ve tried this recipe multiple times (with an 8×8 dish) and it always turns out. Did you use store bought oat flour, or made your own using a food processor? If you made your own – make sure that you process the oats as much as you can, until it’s as thin as you can possibly get the flour. Sometimes when homemade oat flour is left chunky, it won’t rise as much and stays very clumpy. Not sure if that’s what happened but just thought I’d share. 🙂 Let me know if you do try it again. Also I’ll be posting a video for this recipe soon so you can see how I make mine. Have a wonderful weekend! This looks sooo delicious! I love the idea of the mango frosting! I could happily eat that frosting by the bowlful! Such a unique combination of flavors that I never would have thought of but actually sounds so amazing and delicious. I love oats … and MANGOES! Jen it sounds so awesome. Never had a Mango cake or bars. Yum Yum. I will try this. Thanks Jasmin! Yea give it a shot – it’s really tasty!! !